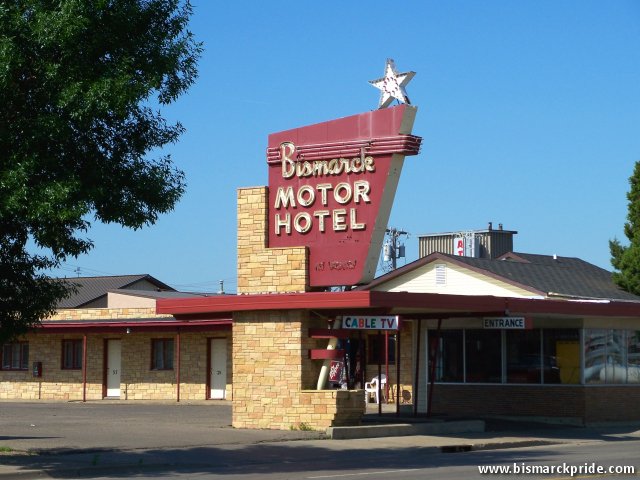 The Bismarck Motor Hotel is a long-time local lodging facility located at 2301 E Main Avenue. Roy Synstegard originated the hotel in 1939 as a tourist camp with three cabins. It had grown to a modern motor hotel with 32 units by 1955, when he sold it to Alfred Retzlaff. Much of the 1950s-era building was destroyed in a 2011 fire. A new hotel was erected in 2013. Until the fire, the hotel was an iconic 1950s-era roadside motel noted for its retro sign featuring a star (pictured in this article). The new sign also incorporates a star, likely as a homage. More recently, it has become designated as Bismarck Motor Motel, but Hotel was its long-time designation.